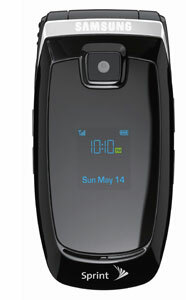 Sprint Nextel has launched the Samsung A640, an attractive clamshell phone with mid-level features. The exterior OLED screen has a background the same color as the phone, making for a striking all black front. Sprint is selling the Samsung A640 for free after $199.99 in instant savings. The online only deal requires a 2-year service agreement. In retail stores the A640 costs $49.99 and should be available now.